Talk about collateral damage! The famous wreck of the French treasure ship La Dromadaire was due in no small part to an ongoing conflict between France, Spain and Great Britain. Thanks to the political upheaval created by the Anglo-Spanish War of 1762-1763, French authorities asked the French East India Company to chart a new course for its ship La Dromadaire (which is French for “camel”) that would avoid possible interceptions by English privateers. Laden with 20 guns, 1,000 cannon balls and a chest of silver, La Dromadaire set sail from the Port of Lorient on February 6, 1762. Ensnared not by pirates, but by bad weather, La Dromadaire was carried into the dangerous reefs off the island of Sao Vicente and broke in two on February 19, 1762, sinking with 77 souls and its entire cargo valued at around $6.8 million. More than two centuries later, the La Dromadaire wreck site was found during a survey of San Vicente Island. Salvors quickly began excavating the site and were able to recover 19 cannons, a semi-precious stone from a ring and 3,377 silver coins. The coins were struck between 1700 and 1762 and feature either the portrait of King Louis XIV – the great Sun King – or his great-grandson, King Louis XV. 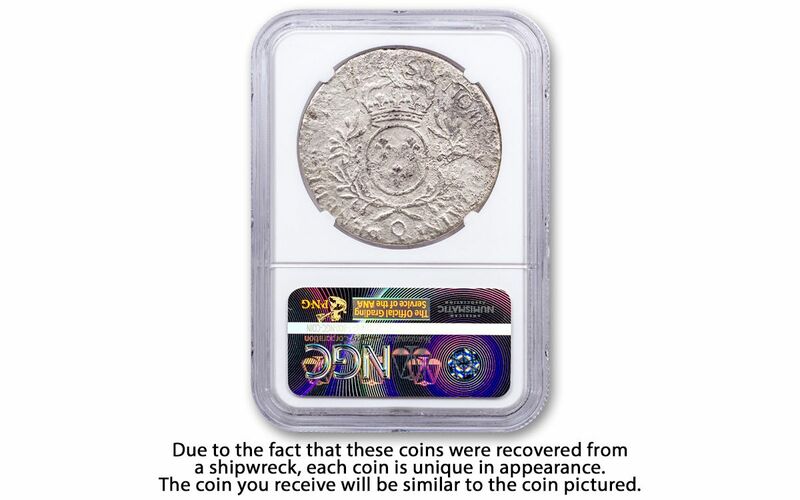 Each coin was struck in nearly an ounce of 91.7% fine silver and has been graded by the Numismatic Guaranty Corporation (NGC) as being in Genuine Shipwreck condition. These are fascinating coins that not only come from a well-known shipwreck, but also represent an important historical milestone in American history. You see, following the loss of the La Dromadaire, the French, English and Spanish sat down and signed the Treaty of Paris that brought the Anglo-Spanish War to an end. The terms of the treaty saw the British withdrawing from Cuba and Spain handing Florida over to Great Britain. To compensate for their ally’s losses, the French ceded Louisiana to Spain as part of the Treaty of Fontainebleau following the end of the French and Indian War, which Europeans referred to as the Seven Year’s War of which the Anglo-Spanish War was part of. 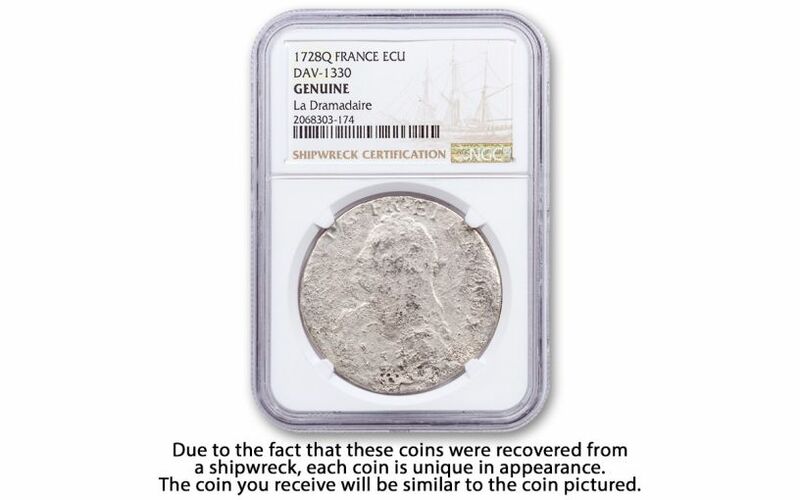 Add this wonderful shipwreck coin to your collection and secure a fabulous piece that also played a role in the history of the United States. Click one to your cart now before our small supply disappears.